For years and years, we Parks and Recs fans lived in fear that our beloved show would be unjustly canceled. It’s always been delightful and hilarious, but the little comedy that could has never been a particular ratings success. Many season finales were written to also serve as series finales if need be — even Ben and Leslie’s wedding was, at one point, a contender for the final episode. (That season, NBC asked for extra episodes. Go figure.) But now that the show’s sixth season is drawing to a close, I’m struck by a feeling I didn’t expect to have: I want next season of Parks and Recreation to be its last. Blasphemy! I know! Who wants to live in a Knope-less universe? But I’d rather Parks approach this coming season with a clear endgame so they can tick items off the wish list rather than drag things out. I may never recover from the acute agony of the How I Met Your Mother finale (which I wrote about here), but the real blow was how stalled-out and labored the show’s last three seasons felt. Set an end date; stick to it; rejoice in the preciousness of seeing the residents of Pawnee one last time. Go out on top! Parks hasn’t gotten less funny, but it is running out of narrative steam a little bit. Just ask Councilman Jamm, Mona-Lisa, or Dr. Saperstein — funny-ish each in (very) small doses, but nowhere near deserving of the amount of screentime they’ve had. Rashida Jones and Rob Lowe might have left for budgetary reasons, but their story lines were fully exhausted. Even more important, I don’t want Parks to become a show about literal parenting, because it’s been a show about social parenting this whole time. How will Leslie be as a mom? Uh, probably great, just like she has been as a mother figure for April, with encouragement and support and open, unflagging love. How will Ben be as a dad? Kind, forgiving, and devoted, just like he’s been to Andy and Tom. The allegedly hilarious aspects of infant-rearing — sleep deprivation, defecation fiascoes, “colic” — are not generally the source of rich humor on television, plus we’ve already seen Parks put Leslie and Ben through those kinds of physical endurance ordeals. Parks is a workplace comedy, not a family comedy, and while I love a good family comedy, I don’t want Trophy Wife to be about an office just like I don’t want Parks to be about finding a suitable nursery school. Seven seasons is a lot for a sitcom. That’s a full, fleshed-out run, and one I really never expected Parks to have. I’m glad it did! I’m glad to have known these characters for so long, to have integrated Galentine’s Day into my life, to have reveled in some truly masterful NPR parodies. But it’s pretty clear that Parks is at the end of its road. 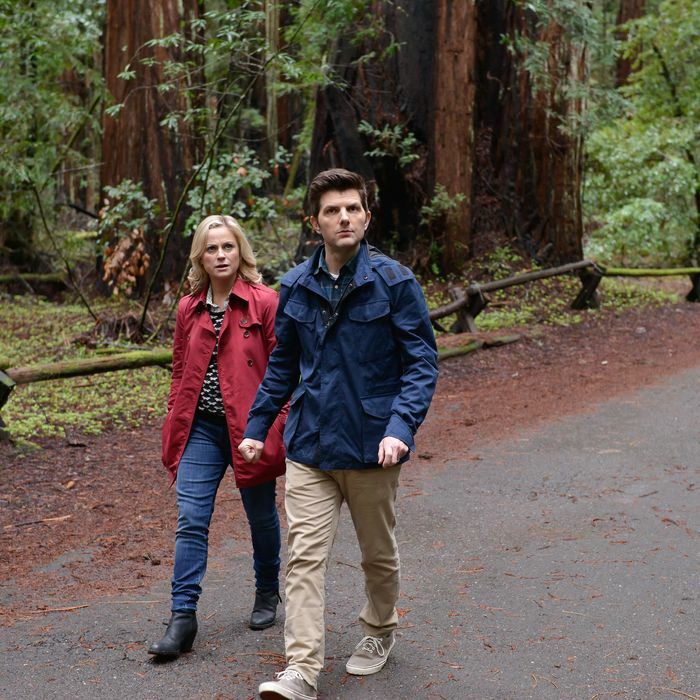 I don’t want Parks to have to conserve its remaining interesting plotlines just in case there are more seasons ahead. I want the show to go into season seven with everything it’s got, going balls out on 22 more episodes, Leslie Knope style, and then gallop off into heaven, on the back of Li’l Sebastian.